Large holes, swampy ruts, and bare ground have become common in Hurricane Michael impacted areas. It is apparent that we need cost-effective, short-term solutions to protect the land from erosion and to deal with the mess that our landscapes have become. Poor soil management today can lead to greater problems tomorrow. It is important to develop a solid plan of action now in order to minimize future repercussions. We consulted our soil and water specialists for tips and advice on soil stabilization and temporary renovation tactics. Drs. Ann Blount and Cheryl Mackowiak are UF/IFAS researchers at North Florida Research and Education Center (NFREC) who were also impacted by the storm. They understand the situation many homeowners are facing in storm-impacted areas of Northwest Florida. 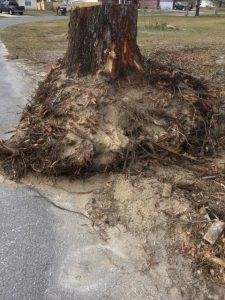 Repairing areas where trees were uprooted is one concern in the hurricane impacted area. If possible, Cheryl recommends removing as much soil from the exposed tree root-ball as possible, allowing it to refill the hole. Using the original soil is cost effective, helps maintain a uniform soil profile, and reduces weight and volume of debris. Removing the soil from uprooted trees and returning it to the original hole is a low-cost soil replacement strategy. Wood chips from ground stumps or chipped branches can also be mixed with existing soil or added to new soil as no cost filler. The buried wood will eventually breakdown and mineralize, adding organic matter into the soil. Mix wood chips and soil at the rate not to exceed 25% wood chips to 75% soil by volume. Another low-cost option may be to partially fill holes with gravel, sand, or fill dirt. Use these lower cost materials to fill the hole to within 4” of the surface. If possible, purchase higher quality products, such as screened top soil or a compost/top soil mix for the upper 4 inches, especially if you plan to replant into the space. Ann provided us with guidance regarding bare soil and areas at high risk for erosion. Grasses not only stabilize soil, they also utilize soil moisture. An immediate action that can be implemented through the end of February is to plant a winter annual grass, such as annual ryegrass at a rate of 50 lbs per acre. Smaller yards can be planted at a rate of 1 pound per 1,000 square feet. Annual ryegrass seed is less than $1.00 per pound and usually sprouts in 7-10 days. Coverage protects soil from erosion, allowing the homeowner additional time to consider long term repair options. . If the site is easily accessible then apply with a lawn or handheld spreader. Broadcast spreading by hand is also acceptable, especially for uneven ground or difficult access areas. It is important to make sure that there is good soil/seed contact by either lightly raking or at a minimum walking over the seeded area immediately following application. Cheryl also reminded us to include fertilizer in any ryegrass establishment plan. Check the label for the starter lawn fertilizer rate and apply half at time of planting and the other half approximately 30 days after ryegrass emerges. Mulches or mats may be needed where there is a severe slope or change in elevation. Covering seed with a light layer of hay or straw will help keep seeds in place and it will maintain moisture necessary for germination. 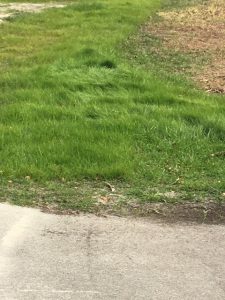 This cool season annual ryegrass strategy should “buy time” for homeowners to make more permanent landscape recovery plans. The annual ryegrass will provide temporary soil coverage through late April or early May, depending on weather patterns. Cheryl shared another observation. Annual ryegrass can have allelopathic properties (inhibiting growth of competing plants), so be sure it is dead before reseeding with a warm-season perennial grass such as Bahiagrass or Bermudagrass. The dead ryegrass can be tilled into the soil to add organic matter, which also helps improve soil structure. During wet periods in regions with a high water table, it is not unusual to find water in post holes within two feet of the soil surface. Bare soil and compaction created by foot and vehicular traffic, especially heavy equipment, can compound this effect. Grass cover can help alleviate some of the excessive moisture and begin to rebuild your soil. If planting grass or other vegetation is not feasible, consider leaving a thin layer of organic debris, such as leaf litter or small branches in place or spreading ground stump or other wood shavings to protect the soil from erosion.. Eventually, additional fill soil may be required, along with assistance from storm-water professionals to repair your land grade. If significant flooding issues are observed or a large modification of the elevation is being considered, homeowners need to consult with county or municipal Planning Departments to avoid storm-water drainage problems on their owner adjacent properties. Residents of unincorporated Bay County can contact the Bay County Planning Department at 850-248-8250. Check with your local municipality if you reside within a city limit. Ideally, the land is properly graded and compacted areas have been mitigated to correct for all routine drainage and stormwater issues before establishing a lawn on a lot. Post-hurricane construction and debris and tree removal, coupled with limited resources, may be economically unrealistic in the near-term. However, rather than delaying all landscape work, we encourage you to do what you can to preserve existing soil and lay the foundation for future landscape restoration. Thanks again to Cheryl and Ann for their help and support as we all continue to make positive strides towards recovery after Hurricane Michael.